An artist’s rendering of Campus Village 2. 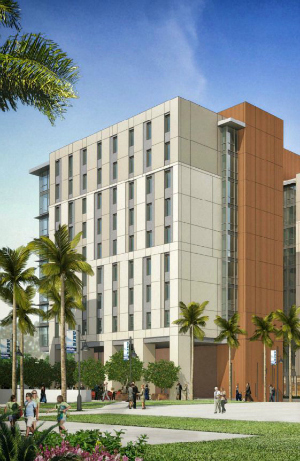 SAN JOSE, CA – Seeking to modernize student housing and foster a sense of community, San Jose State has broken ground on a residence hall. “Campus Village 2 was designed to support student learning and activities,” said Victor Culatta, director of University Housing Services. The building will accommodate 850 students over ten floors. Current plans call for the building to open to freshmen in fall 2016. The 193,000-square-foot tower is under construction in the southeast corner of campus, near existing housing including the first phase of Campus Village, completed in 2005. University Housing Services worked with Facilities Development and Operations to envision living spaces that will support social interaction. Residential units will be organized in L-shaped wings of 25 double-occupancy bedrooms, with two wings per floor. The rooms will open onto shared halls, encouraging residents to get to know each other. Each residential floor will feature a quiet study room, an activity room and a laundry room. Offices and meetings space for student groups and the university community as a whole will be on the first two floors. Courtyards on the east and west side of the building will be available for student activities. Decorative details will evoke a strong sense of historical continuity and campus connections. Exterior accent walls will feature a brick facade reminiscent of the traditional, three-story dorms. Inside, plans call for décor featuring symbols of school spirit and iconic landmarks such as Tower Hall. Overall, Campus Village 2 will achieve Leadership in Energy and Environmental Design (LEED) Silver equivalency standards, including a good deal of natural lighting. 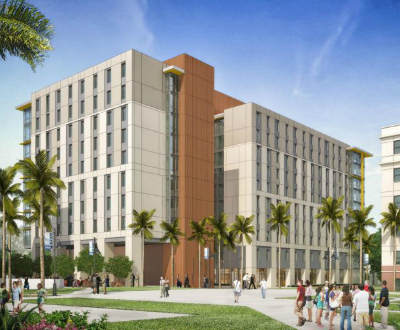 “Studies have demonstrated that on-campus residential living plays a significant role in promoting student engagement and improving academic success and student retention,” SJSU said when securing approval for the project from the California State University Board of Trustees. The architect is Solomon Cordwell Buenz and the design-build contractor is Sundt Construction. The budget is $126.1 million, and will be financed through the CSU Systemwide Revenue Bond Program and from housing program reserves. Housing revenue will repay the bond financing. The new residence hall’s completion will clear the way for the next step in efforts to update the southeast corner of campus. Plans call for an expanded aquatics and recreation center that will cover space currently occupied by two traditional dorms dating back to 1960.